Okay, so I decided to present these outfits in a different way this time (and future times, probably), by using Polyvore to put the clothes into one cohesive image, rather than a million different pictures. Those pictures were extremely hard to format, and while I do not consider this way any better, in terms of aesthetics (on the contrary, I did like the find the other way better to look at), I do find it much, much easier to do. So there you go. This week I put together a cute, sleeveless dress, footed tights, and ankle boots for your viewing pleasure. Once again, these outfits are put together by category: under $20, under $40, and under $1000. The over $1000 category is way too impractical and works mostly for single items, rather than whole outfits, so don’t expect to happen any time soon. Anyway, onto the outfits! All of the items above are priced less than $20. What you can’t see in this picture of those white (“cream”) tights is that they have a lace pattern on them that is quite nice. You can get them here, at Forever21, and they are on sale for $2.99. I think that three dollars for tights is lovely, don’t you? Next up, the dress. It’s $19.50 at Wet Seal, here, and comes in sizes small to large. Okay, so the deal with those boots? Newport News (those bastards…) do not have a picture of the shoe color that I chose from their website. What kind of retailer are they?! Disgusting… But, they *did* have a swatch of the color, which is what is in front of you now. Yeah, that purple color. Your job: imagine those boots, in that color. 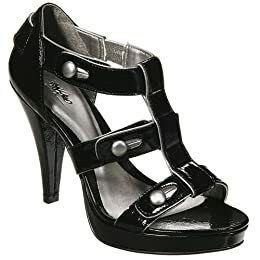 And get them here, for $17.99, and choose from sizes 5 to 10 and 11. All of the items above are priced less than $40. These tights are so gorgeously purple (or “lily,” as Shopbop describes them…), and I love them. Get them here, for $36. They come in sizes small to medium/large (with two sizes in between, so go check it out). Next up, that lovely dress. Lace is a love of mine, of course. I think the contrast of girly and down-to-earth (from the boots) make for a nice combination. Get it here, at Forever21, for $22.80. The dress comes in sizes extra small to large. I really like these boots, as well, although I know that some of you dear readers won’t. They are cowboy boots, after all. You can buy them here, in sizes 6 to 9, from Wet Seal. All of the items above are priced less than $1000. I like this outfit most of all (at least, I think so… I really like all of the outfits, though), mostly because of the boots and the dress. So retro! Anyway, the tights are available here, at Shopbop, and they come in size 4 (which I take to mean the regular tights sizing and not juniors or misses sizing…). Yes, they are foldover, but who’s really going to see that when you have that dress on? Also, I know that these only have one size available right now, but I’m so sure that that will change soon that I decided to post them anyway. So there. The dress is from Anthropologie (after that disgusting romper, I needed something to remind me how awesome this store is most of the time…), and you can find it here, for $128. It comes in sizes extra small to large. Finally, those fabulous boots! Look at that bow! Get them here, at ModCloth, for $42.99. You can choose from sizes 5.5 to 9, and you better. Who better to wear these shoes than one of my readers? Oh, right. ME. max rave - women's bow flats. First off are these super cute (and super cheap) bow-featuring, heart-printed (on the inside, at least) lovelies. Which you can find these pink ones here, at Walmart, for $13. They come in four different colors, though: the already-mentioned pink (sizes 6 and 7 to 9.5), blue (sizes 7, 8, and 9), gold (sizes 6 and 8), and black (sizes 6 and 7 to 9). Why, yes (I do love parentheses). women's mossimo supply co. oleta button flats. These ones look so damn comfortable! Can’t you imagine slipping them on and feeling better about the day ahead because at least your shoes won’t hurt you? Or is that too depressing? Regardless, these shoes would probably make someone ridiculously happy. They come in sizes 5 to 10 and 11, and you can get them here, at Target. That happiness will cost you $17.99, though. I really like that strap across the middle of these shoes. It reminds me of the kinds of shoes that dolls wear, which I find adorable. Hopefully, you do, too. Find them here, at Wet Seal, for $18.50. They come in this silver and a nice black, and the sizes available include 6 to 9 and 10. Okay, I understand that many people may not like the dazzling shoes that lay here before them, but hear me out: um, yeah, I don’t really have an excuse. Never mind, then. Get them here, at Target if they don’t scare you. For $18.80, you can choose from sizes 6 to 10 (with no half sizes in between) in this great gold color. 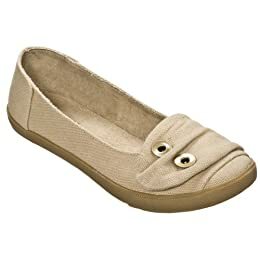 Lastly, I have these interesting and dressy flats from Charlotte Russe. They remind me of summer and garden parties. Want some of that in your life? Buy them here for $18.99, in colors white, black, and yellow. They come in sizes 6 to 10 (once again, with no half sizes in between). Go forth and prosper in shoes. Did anybody have a doubt about my love for ruffles? …I didn’t think so. Anyway, this “Thrifty Thursday” post will soon become routine. In short, everything written in a post like this one will be under $20, hence the “thrifty” part, of course. This week, I found a lot of ruffled shirts (nine, in total.) from various places (but mostly from Forever21, where the ruffle rules apparently). Unsurprisingly, a lot of them are white, but I did find some gorgeous colors, with equally interesting names, such as “aqua” and “sage,” which is really code word for “light blue” and “teal,” respectively. Go figure. First up, is this little number that features puff sleeves and an interesting trim that Forever21 has taken to calling “crochet-like bubble edge details” (but I’m guessing they didn’t know what to call them, really). Regardless of the weirdly-named detailing, this shirt would be a great addition to any wardrobe. Buy it here, at Forever21 for $15.80 in yellow, pictured, and “ivory” (white, for all you non-elephant-poachers). Both comes in sizes small, medium, and large. Next, I have this tuxed-like shirt to show you dear readers. The ruffling in this shirt is considerably less eccentric than many of the pieces featured here, but it has the addition of a waist tie that I really like (you know bows and me…). Buy it here, at Papaya, for $15.99, in sizes small, medium, and large. ruffled cap sleeve top shirt. This beauty is next. Look at all those ruffles! Except, this is nothing. Look down at the bottom of this post, and then you’ll know how many ruffles Forever21 can stuff on their blouses… It is a very classic-looking ruffled shirt that will lend itself well to an accompanying vest, especially because no ruffles lower at the waist means no weird bunching under said vest. Buy it here, at Forever21, for $17.80. Sizes include small, medium, and large. Oh, no! Another white top! I told you this would happen, didn’t I? Well, don’t despair; most of the rest have other colors to choose from. Anyway, this one here is definitely ruffly. I mean, look at that fan detailing in the collar! Gorgeous… Buy it here, at Forever21, for $17.80. This white top comes in sizes small, medium, and large. Am I sensing a pattern here, Forever21? Do they not have such sizes as extra small or extra large? How droll. This shirt is one of my favorites. Partly because of the color and partly because of the little ruffled cap sleeves. Adorable! Buy it here, at Wet Seal, for $18.50, and choose from the aforementioned aqua, which is pictured, and black. Unlike Forever21, Wet Seal offers its customers sizes extra small to extra large, in both colors. I like that this shirt would look really great with a wide black belt around the waist. The collar is also lovely, and I adore those little buttons at the top of the collar and at the bottom of the keyhole. It’s $18.99 here, at Charlotte Russe. This top is the last white one, which is the only color it comes in, but you can get it in sizes small, medium, and large. What a great color! I’m lusting after it already. Except… the crepe turns me off just a wee bit. The texture can be unsettingly, like old people skin, but other than that disturbing fact, I really do like it. If you do, as well (and don’t mind the old people skin), get it here, at Forever21 (where else?) for $19.80. It comes in the pictured sage, yellow, and white, which all are available in Forever21’s only three sizes (apparently): small, medium, and large. Like cotton candy? Then, you’ll love this shirt. Isn’t it just the epitome of cotton candy clothes? I assure you, dear readers, it is. Lightly striped and immensely ruffled, this shirt is fantastic. The smocked waist will also help to give an illusion of an hourglass figure, which is always nice. Get it here, at Forever21 (stop hating! the last one is from there, as well…), for $19.80. Buy either the featured peach (pink) or cream (white) in sizes small, medium, and large. Okay, last one! It seems as if Forever21 just crammed as many ruffles as they could onto this shirt. It’s like some sort of ruffle factory… Do you think that they keep appearing the longer you wear it, and before you know it, they’ve eaten you? …shudder… Maybe I wouldn’t mind, though… I do love those ruffles! Anyway, enough horror stories. Get this ruffle monster here, at Forever21, for $19.80. Both the orange, pictured, and the white come in small, medium, and large. Way to break the mold, Forever21… NOT!